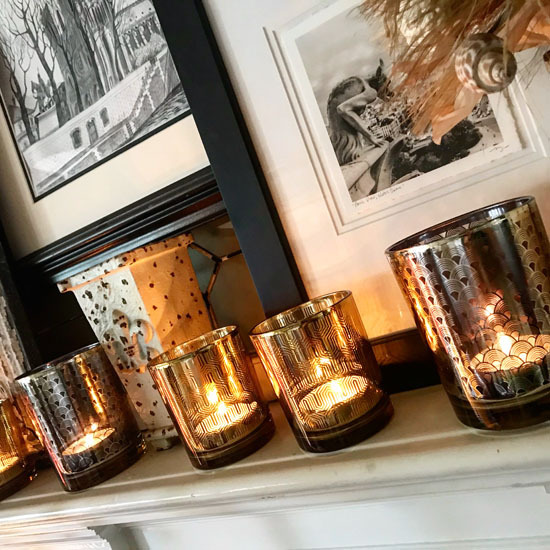 Nothing adds more personality and romance to a room than candles. We love to bathe ourselves in candlelight on the outdoor patio, too. No meal should be eaten, no movie should be watched and no housework should be done without candlelight adding to the ambiance. SOLD OUT!!!! We are so in love with the finish on these fabulous reproductions that we immediately tucked away a pair for ourselves. Gold gilded white and tan, with hints of black. Wood and resin. Holds 3" or smaller candle. Base 5 1/4". Overall Height approximately 12". We like them as a pair, but you can add just one to your collection. Sold individually. BACK IN STOCK! Consider this the black tie outfit for tealights. Mercury glass is more popular than ever despite the climbing prices. While we love the real deal, these reproductions are far more affordable, allowing you to deocorate in multiples. A local film studio literally placed hundreds at a recent movie premiere dinner and we always use at least 20 on our farmhouse table for dinner parties. We suggest at least a minimum of three to create the romantic vibe, so these are solds as a trio. Delicately detailed with ribbed edging. 2.3" H x 2.8" Diameter. Imported. Sold individually. 4 1/4 H x 3" Wide. Not water or food safe. Items under $25 incur a $2.00 handling fee in addition to ship charges; over $25 are direct UPS ship charges only. Darling design of scrolling vines of silver on silver reproduction mercury! 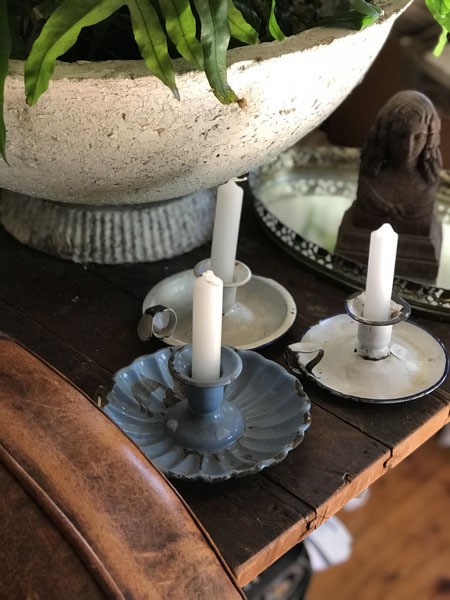 We love to mix this design in with our other tealights to give a look of a well-travelled collection! Approx 2.5 x 1.5. Sold individually. 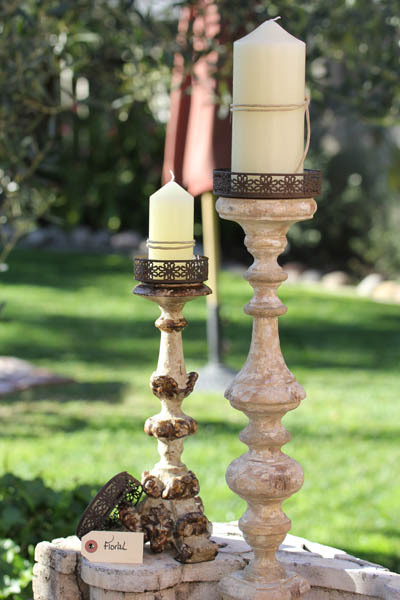 Similar to our Versailles Vase, this lovely style is now offered in a tealight! 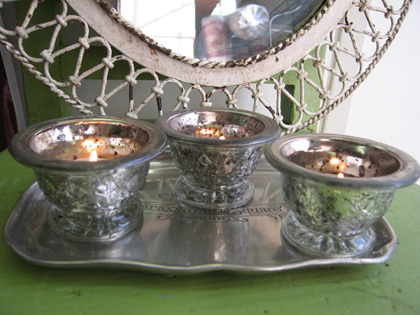 Our decorating motto: one can NEVER have too many tealights! They absolutely are ideal for any occassion-even a breakfast table. 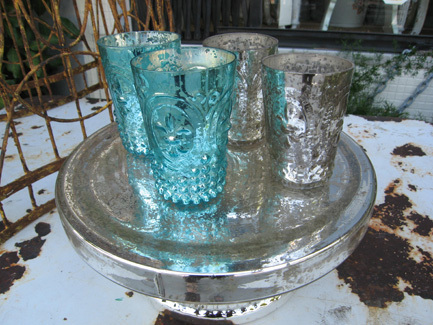 Mercury glass is more popular than ever despite the climbing prices. While we love the real deal, these reproductions are far more affordable, allowing you to deocorate in multiples. 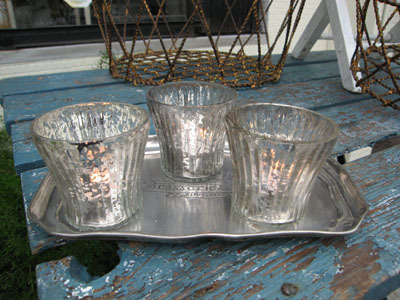 We suggest at least a minimum of three to create the romantic vibe, so these are sold as a trio. 2.5 x 2.5 Imported. Same as the silver and acqua and blush, but in a mini version! 2.5 x 2.3" Wide. Fabulously elegant! 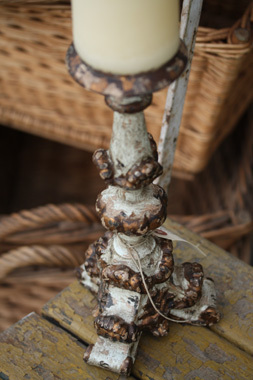 Fleur de Lis is on all sides; hobnail design on bottom and all with DISTRESSED mercury look. 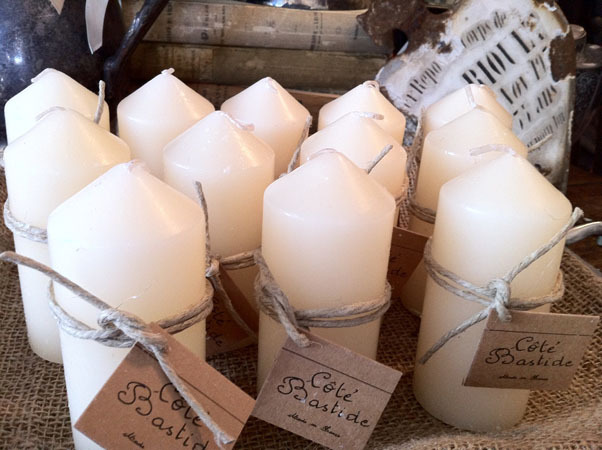 Mix these in with tealights of other sizes, nestle amongst candlesticks, display in three's or nine's or twelves! Sold as a pair. Not water or food safe. Reproduction mercury in silver. FIVE AVAILABLE! We're CRAZYYY for figs and this heavenly scented candle does not disappoint. From our tres chic designer friends at Cote Bastide, this glass container has all the usual gorgeous packaging details. 6.1 oz. Unboxed in glass container. Paraffin wax. Imported-Aix en Provence, France. SIX AVAILABLE! 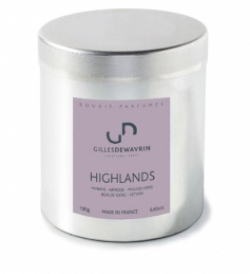 Absolutely wonderful, clean linen and rose scent; simple and light. Glass container has all the usual gorgeous packaging details. 6.1 oz. Paraffin wax. Imported-Aix en Provence, France. 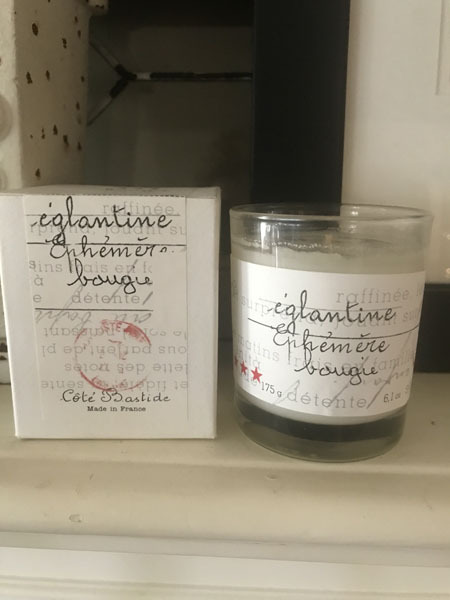 Hand poured in the South of France, these church candles (referred as such by the frequent use in votivo and prayer settings) a perfect creamy color, with signature Cote Bastide tag. These burn thoroughly and evenly. Measures 4" H x 2" W. Imported: France. Incredibly creative from the Paris-based company comes these plastic tubes scented with wonderful aromas to line your suitcase, linen closet, drawers, etc. 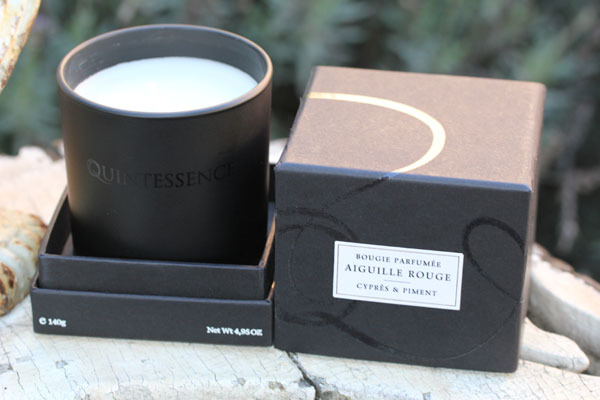 An elegant gift to be sure in a black noir box that opens like a drawer. Tubes will not melt and last approximately 6 months. Paris, France. Mini wax candle tapers measuring 6" long x 1/2" diam. Arrives in beautiful gauze bag. Twenty-four candles. New; Aix en Provence, FRANCE. ONE SET AVAILABLE. No more ruined tabletops or floors! Fabulous heat-resistent sheet metal in gorgeous crown designs. One set of 3 includes Large (4.75" Diam), one Medium (3.75" Diam) and one small (3.25" Diam). Choose from 4 different styles. Reg. Price $32.00 $27.50 On Sale, Lucky Dog! 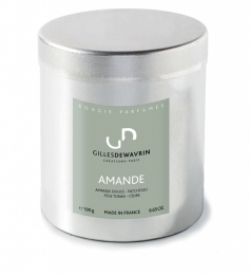 Based in the heart of Paris proper, Quintessence candles are made using the finest mineral wax and French oils. Quality beyond quality. Burn time 35 hours. Ceramic pot in an elegant black box. New-Paris. Fig is comprised of the heavenly scent of true fig with a gentle hint of amber. Another favorite of Vintageweave's owner. SOLD OUT. 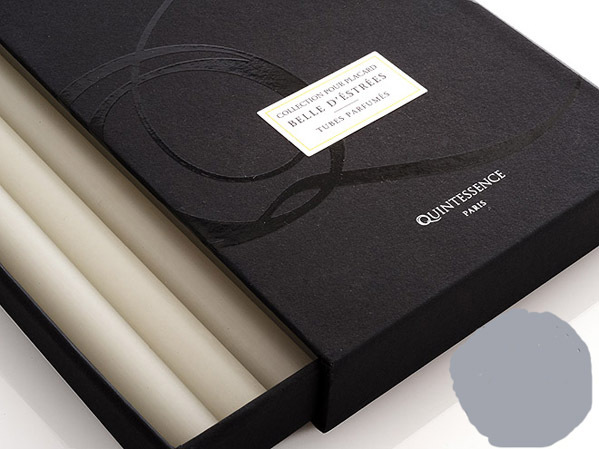 Based in the heart of Paris proper, Quintessence candles are made using the finest mineral wax and French oils. Quality beyond quality. Burn time 35 hours. Ceramic pot in an elegant black box. New-Paris. 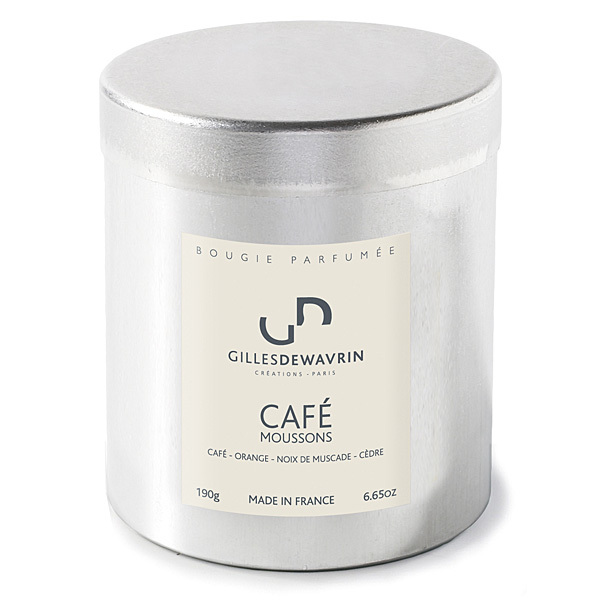 Aiguille Rouge evokes a scent composition of cypress, basil, rosemary, jasmine, musk and a hint of chili pepper and tangerine. A favorite for those who enjoy the smell of bark and walking through the woodsy area near a beach. Vintageweave owner's personal favorite. TEMP SOLD OUT. 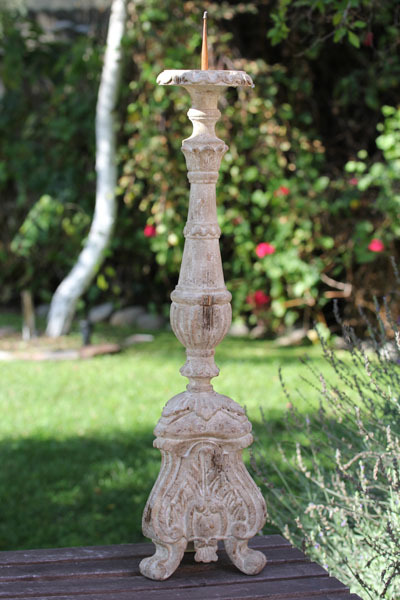 Lovely bougeoir, or Taper Candle Holder. Almost identical, these white styles measure approx 6 1/2" Diameter in good condition. Sold individually. France, circa 1930's. From Paris comes this beautiful new line with simple, industrial lines for unique flair. From Paris, France comes this beautiful new Parisian line with simple, industrial lines for unique flair. 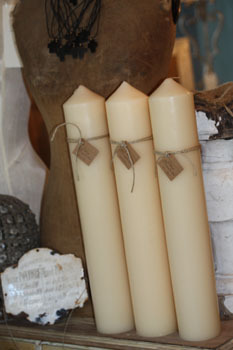 From the classic French candlemakers comes a set of 20 clean white church candles measuring 4" H x 3/4" Diam. Scent Free. 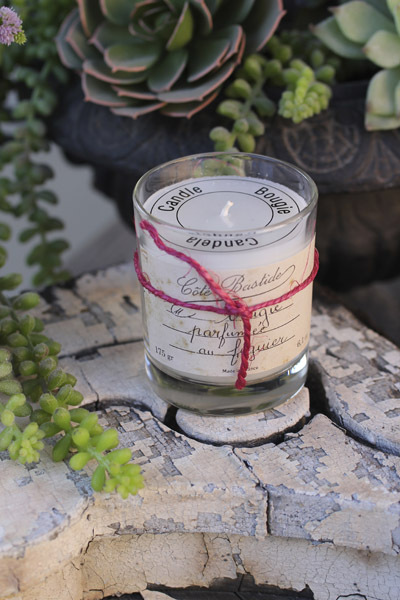 Imported from France, from the high-quality candle maker Bougies la Fran�aise. You are purchasing one box of 20. 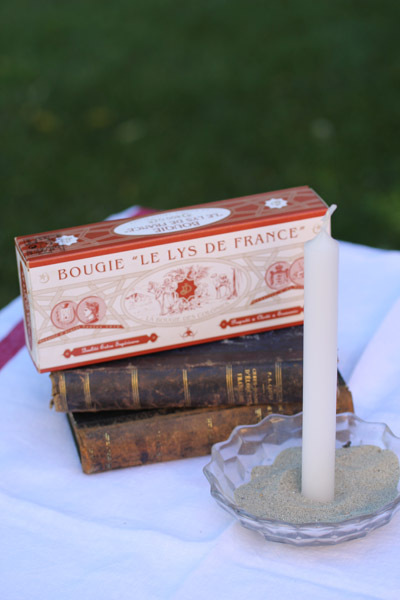 From the classic French candlemakers comes a boxed set of 8 clean white church candles measuring 9" H x 1" Diam. 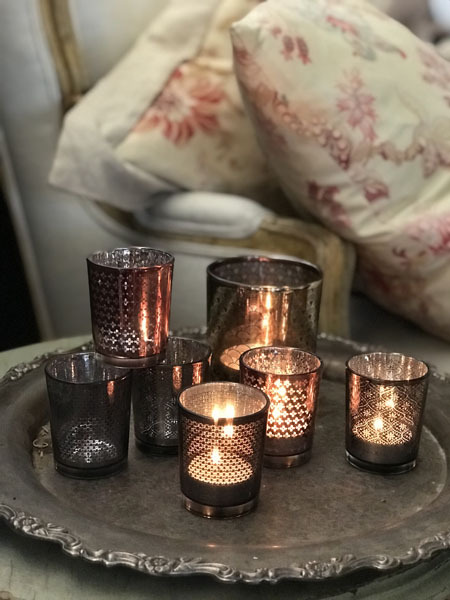 These are the revolutionary DRIPLESS candles with a unique design of holes atop the candle allowing wax to drip inside; this allows the lengthening of burn time as well as prevent drips. Scent Free. 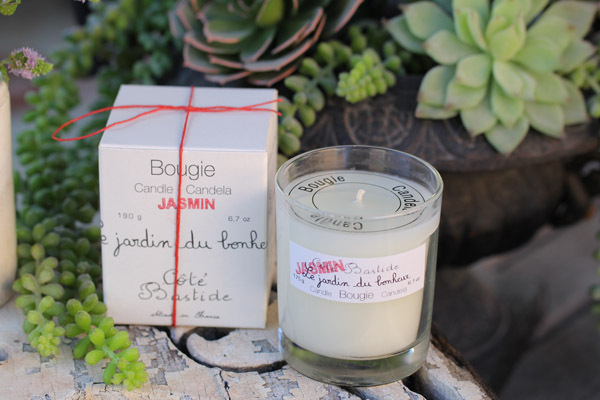 Imported from France, from the high-quality candle maker Bougies la Fran�aise. You are purchasing one box of 8. 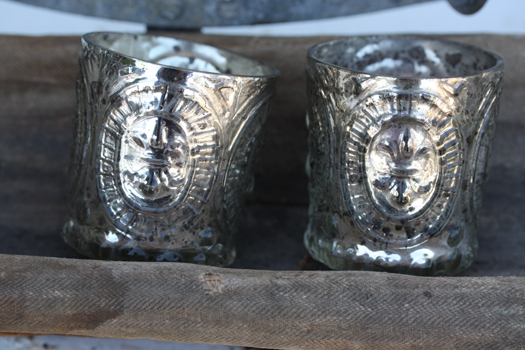 From the classic French candlemakers comes a boxed set of 8 clean white dinner candles measuring 7" H x 3/4" Diam. Scent Free. 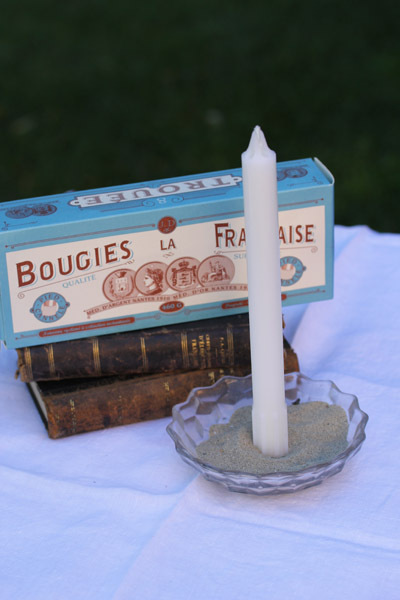 Imported from France, from the high-quality candle maker Bougies la Fran�aise. 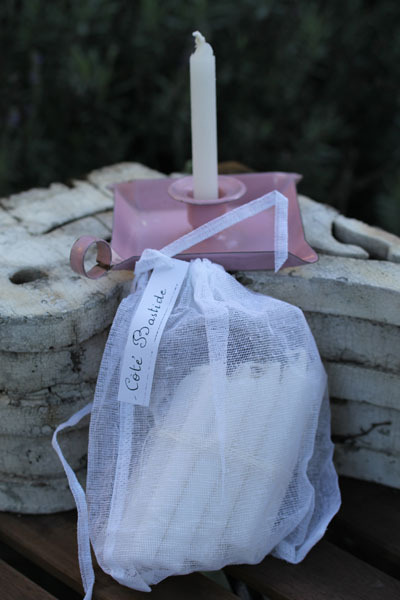 You are purchasing one box of 8 individual candles. Reg. Price $445.00 $220.00 On Sale, Lucky Dog! 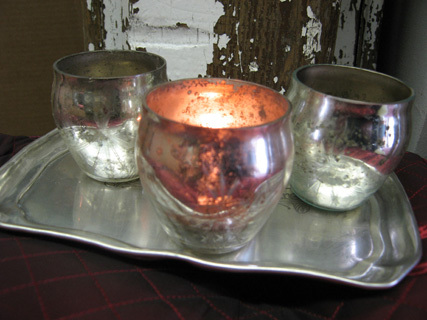 Unbelievably gorgeous distressed mercury votives generously sized at 3.5 x 3.5. Comes with votive candle each. (Not water safe to use as a vase; mercury will come off.) Set of four each. If you'd like four or more of all the same color variation, contact us vintageweave@gmail.com or specify in comments when ordering. New.